Make the most of your space with our Chichester dining sets. Featuring simple, backless picnic benches, our Chichester dining sets are refined and do not take up too much of your garden space. These teak dining tables are chunky and solid, ensuring extreme durability and longevity. Made out of high quality grade-A teak, our teak dining tables are weather and insect resistant and can remain outdoors all year round for minimal fuss and easy, fruitful use. Keep your guests entertained this summer with this graceful high-end Large Chichester teak garden table and benches set. Offering a wonderful combination of solid construction and a contemporary style, this great value chunky teak garden table and benches set can be incorporated into any garden or patio setting for the ultimate al fresco experience. Our Chichester dining sets will make a lovely focal point, especially when teamed with one of our parasols. Providing ample seating and room for al fresco dining, our teak dining tables are excellent for outdoor dinner parties. 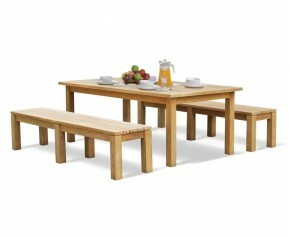 View our range of Chichester dining sets here.